Tim Challies : Here on TallSkinnyKiwi tomorrow. UPDATE: Tim Challies appeared here. ORIGINAL: Go to Google and type in “world’s most famous christian blogger” and you will be looking at the blog of Tim Challies. 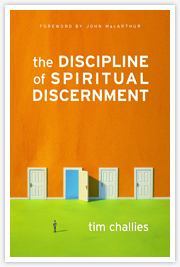 Tim will be here on my blog tomorrow (Tuesday) to talk about his new book The Discipline of Spiritual Discernment, to answer some of my thoughtful penetrating questions, and to interact with your gracious and stimulating response. Quite a bit of controversy over Tim’s subject material and whether Tim, without any formal theological training and “professional” ecclesiastic credentials, should write this book. I think he will be in good company on this blog. Good to see at least someone is practicing the priesthood of all believers. Tim is a web designer, a geek, a Canadian, a theoblogian and a really well known Christian blogger at Challies.com. Tim and I both made the Feedster Top 500 when it existed but Tim scored higher than me so I chose to ignore him and treat him like a Philistine. Tim hangs out with the more conservative, sometimes fundamental, crowd and he has transformed the concept to “live-blogging” conferences to a new artform. I will be interested to hear how he approaches the subject of discernment as a blogger and if the self-correcting function of the wisdom of crowds has a part to play in finding truth. I also want to explore the blog to book process and see what Tim has learned. Should be a good conversation. Here is the whole blog tour so you can track with the Challies all week long. hmmm … controversy over whether someone without “official credentials” should write a book on spiritual discernment. LOL! if Tim discerned he was supposed to write a book on spiritual discernment but didn’t due to lack of credentials, then wouldn’t his disobedience disqualify him from having anything to say on the topic? and if those who criticized him for not having credentials discerned he should therefore not write the book, that means they have spiritual discernment and they themselves should therefore write the book, and so wouldn’t their disobedience for not writing the book on spiritual discernment thereby disqualify them from saying anything discerning?